(Newser) – Militants attacked a US base in Afghanistan near the border with Pakistan today, setting off bombs, torching vehicles, and shutting down a key road used by NATO supply trucks, officials said. 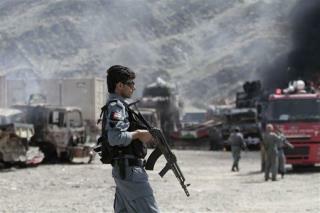 At least three people—apparently all attacking insurgents—were killed. The Taliban claimed responsibility for the strike in the Torkham area, the latest in a surge of attacks in Afghanistan as US-led foreign troops reduce their presence en route to a full withdrawal by the end of next year. GET THE HELL OUT OF THE PIT RIGHT NOW AND JUST LET THE SAVAGES KILL THEMSELVES! It's almost as if they didn't like us killing them. "Does this suicide vest make me look fat?"